For the first time in the 2016 presidential election race, voting soared in both parties on "Super Tuesday 2." 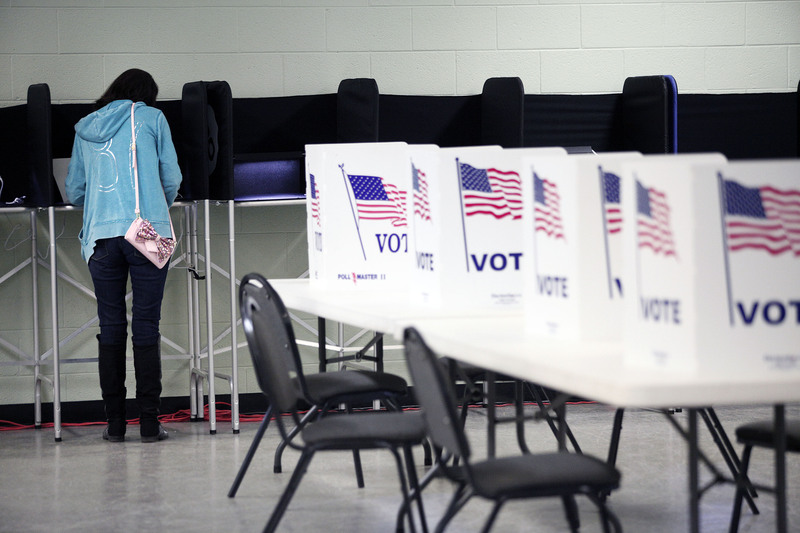 Although exact comparisons cannot be made with 2008, turnout was up by about 55 percent. Nearly 3.4 million voted in Michigan, Mississippi, Idaho, and Hawaii, according to preliminary numbers from the Associated Press. That number could increase as more results roll in, especially from Hawaii, where the count continued early Wednesday morning. In Michigan, turnout was so high some areas ran out of ballots. Comparing the same states, that's a big leap from 2008; there were nearly 2.2 million who came out to the polls in the year that pitted Barack Obama against Hillary Clinton and John McCain against a large number of other Republican contenders, including Mitt Romney. The reason exact comparisons cannot be made is that the schedule differed. Michigan voted in January, the Idaho Republican primary was in May, and Hawaii didn't have a Republican presidential preference poll. There aren't numbers on how many people participated in the caucus there. Only Mississippi voted around the same time of March — which in 2008 was comparatively late. Super Tuesday that year was Feb. 5, more than a month before Mississippi's vote on March 11. More than 20 states voted that Super Tuesday, and the following week only two states and the District of Colombia voted. That makes comparing each year's "Super Tuesday 2" impossible. These numbers look at the 2016 states in both elections. In at least Michigan, this was a record-setting number, beating the turnout in 1972 when Richard Nixon and George Wallace won the Republican and Democratic primaries respectively. This year in Michigan alone, nearly 2.5 million people voted Tuesday in both parties. The 1972 record was 1.9 million. Turnout was so high that in some areas people stood in line long after the normal end of voting at 8 p.m. In places where ballots ran out and had to be photocopied, the counting process slowed somewhat. Much of it had to be done by hand. Some credited the turnout with the Flint water crisis. That could be. The Republican turnout was up by about 50 percent, but it was in the Democrats' race that we saw the huge change from 2008 — which in most other states was a record-setting primary. But not Michigan. There, Democratic turnout this year nearly doubled 2008 numbers. That could be because in 2008, Michigan broke the DNC rules and moved up their vote into January. That led Barack Obama (and several other Democratic candidates) to have their names removed from the ballot. Voters may have stayed home if their preferred candidate wasn't an option, although nearly 40 percent of the state voted uncommitted. Until now, only Colorado had seen an increase in Democratic turnout. Mississippi only saw an increase in Republican turnout. The state overall was up about 50,000 votes, but the Democratic turnout was about half what we saw in 2008. The GOP more than made up for it. The GOP saw turnout up about 180 percent — the biggest single party increase in any state on Super Tuesday 2. This is also the state where Donald Trump won the highest percentage of the vote. Mississippi has proportionally the largest black population of the four states, and new research says that Trump benefits when white voters feel racial resentment — something that increases with the number of minorities in an area. Despite Sanders' close win in Michigan and Trump taking home three states, it was actually Clinton who took home the most total votes on Super Tuesday 2. She received just over 752,000, while Trump received just over 738,000 — and he had two more states voting than she did. How the delegate count will affect the race matters even more, but seeing an engaged electorate is a good sign for November — at least in the GOP. The Democrats have been worried, but Michigan should make the left-wing pundits sleep well tonight.